Is there any place more restorative than a forest with bubbling mountain streams? Prancing along the stream bank I was all-at-once: Robin Hood of Sherwood Forest on a handsome steed; Alan-a-Dale, Troubadour of Robin’s Merry Men, and the Connecticut Yankee in King Arthur’s Court. The roller coaster trail through the hemlocks: my avenue to glory; my connection with a wonderful world of adventure and honorable conduct with valor. Tree finds a footing on a rock ledge. As a galloping ten year old boy in rural Connecticut, my life contained alphabets of imaginary characters gleaned from comic books, the radio and The Book of Knowledge; a farm boy, a reader, and a lover of the woodlands deeply vested in mountain laurel that stretched behind my parents home for miles over Rattlesnake Mountain. Blossoms parachute through the shamrocks. All of this came back to me as I strolled through the winding Highland Trail in Ricketts Glen over granite ledges and escadrilles; sighting down deep rock crevasses, observing trees growing out of rocks and early summer flowers winking from the shamrocks at my feet surrounded by princess pine vines lining the dark forest floor. Is there anyplace more restorative than a forest with bubbling mountain streams? As a boy I had my stream. I played there endlessly following the trails left by trout fisherman in funny hats, flannel shirts, and green waders with yellow soles; past the old mill wheel that was stuck at the end of the spillway by a metal pump frozen in rust. Jumping rock to log; pool to pool, rock to rock endlessly searching for adventure. Rain or shine, summer and winter, there was nothing but wonder and beauty in my forest. 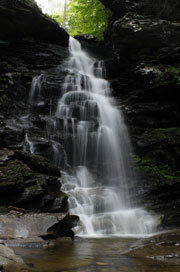 From the start, at Ricketts Glen, the winding trail through the forest smells mustily of life, death and renewed life. Rotting trees and leaves give way to early summer flowers. The quiet forest trail, before reaching the streams, brings wonderful bird songs to the ears. The ascent back up from the glen seems endless, but you can do it. Hopeless to count, "just know this trail is not for sissies." 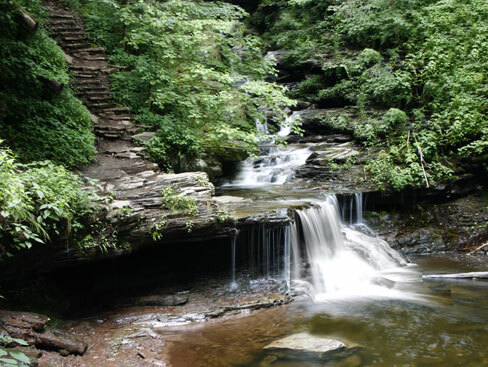 This is the story of Ricketts Glen in central Pennsylvania: a thousand stone steps descending deep into the dark forest, home of 22 named, magical waterfalls of extraordinary beauty. The shortest trail in the park, 3.5 miles long, descends 1.75 miles down, returns 1.75 miles up via a loop. The depth of the glen is about 800 feet. The loop trail is one where you can choose to traverse in either direction, each direction having its advantages of view and disadvantages of steepness. 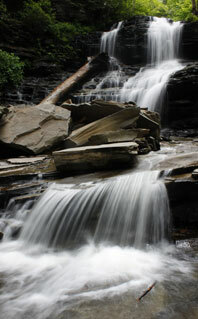 Magical falling waters can be soothng to tired feet. The ledge shelves provide dark backgrounds for the falling, rushing, crystal clear waters. The trail into the glen, descends on steps forged by hand into the deep ledges, it follows the stream bed on sturdy, beautifully constructed steps and paths. You can almost hear the voices of the workmen who built these wonderful trails through the forest over knee crunching shale ledges, creating the steps and walkways that lead downward and then upward some 800 feet or more to the point of trail origin. It is a long loop down one mountain stream and back up another. The falls are spectacular—did I say that already? This is not a trail for sissies (I say that again, too), it is actually hard to watch your step with the breath-taking views around each bend. 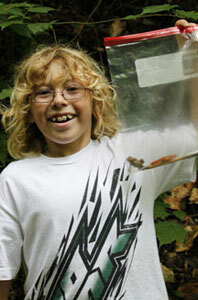 An oncoming young hiker named Logan, about 10 or 11 years of age, proudly displays his findings: a toad and a salamander, saved in a plastic bag. “They won’t live long if you take them home”, says I—he indicates he will release them soon. My friend, Logan has found some friends. 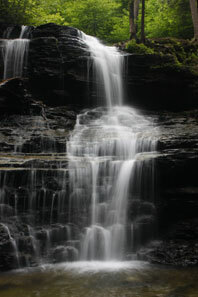 The photos that follow are just a few views of the waterfalls. Please enjoy the views then mark your calendar and make an effort to visit this extraordinary spot in the farm country of Pennsylvania. Places like this are rare and getting rarer. The trail and stream of my boyhood was plowed under to allow for a newer, little-bit straighter Route 2 in Connecticut. The stream bed now runs beneath the highway in a corrugated culvert where a treasure was lost to the name of progress, but if you listen carefully at the culvert opening you hear the echoes of knights galloping to save maidens and prove their worthiness to their kings. All who wander are not lost. Restorative healing is available in what you share here; God’s amazing paintbrush. Water colors? Thank you, again for your willingness to Journey for us all. You certainly know how to bring us the heart and soul of a place. After reading this and viewing your photos,I felt as if I had actually been to that amazingly beautiful place. Thankyou for sharing it.